The Vancouver Condo Buzz » AMAZING PROJECT! The Sapperton at Brewery District New Westminster Condo Project by Wesgroup Properties. First of 4 Residential Towers at The Brewery District Master Planned Community! AMAZING PROJECT! The Sapperton at Brewery District New Westminster Condo Project by Wesgroup Properties. First of 4 Residential Towers at The Brewery District Master Planned Community! The first of 4 residential towers at the master planned New Westminster Brewery District is now pre-selling! Called The Sapperton at Brewery District, this new New Westminster condo high-rise will feature an impeccable location just 250 metres to the c. It’s only a single stop to the Expo SkyTrain Line and two stops to the Evergreen SkyTrain Line, making the entire Lower Mainland very accessible to residents. The Sapperton New Westminster condos at Brewery District are also just 25 minutes to Downtown Vancouver via transit and 25 minutes to YVR by car. Highway 1 is also just five minutes away. The master planned Brewery District New Westminster condos will also be within walking distance to Save-On-Foods, Shoppers Drug Mart, Browns Socialhouse, Starbucks, big box retailers, amenities and local services as the community is already building out. The New Westminster Sapperton Condos will also feature 9,450 square feet of outdoor amenities (including shared garden plots, a children’s play area, view terrace, large green space, outdoor dining area, and social space) in addition to over 10,000 square feet of amenities (including a fitness gym, yoga room, squash court, clubhouse party lounge, treatment room, dance studio and meeting rooms) for residents living at the exclusive Brewery District community. The Sapperton New Westminster condo high-rise will feature a spacious rooftop terrace with lounge space, fireplace, BBQ and dining area encompassing more than 1,000 square feet of view space in addition to private decks and patios. The high-rise tower at The Sapperton New Westminster real estate development is the first of four residential projects in this neighbourhood and will feature secure parking and restricted elevator access in addition to the New Home Warranty. The Brewery District in New Westminster is also the home to the two largest employers in the city, Translink/Transit Police and Royal Columbian Hospital. Top ranked schools are nearby and they include Richard McBridge Elementary School, Herbert Spencer Elementary School and New Westminster Secondary School. Residents at the New Westminster Sapperton condos will also be within walking distance to both the Historic Sapperton Park and Hume Park. 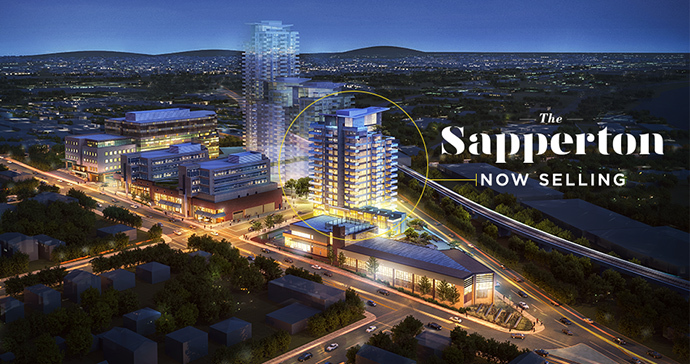 The site location for The Sapperton at Brewery District is 285 Nelson’s Court New Westminster. You can find out more about the project at http://thebrewerydistrict.ca/residential/overview/ or simply www.thebrewerydistrict.ca. 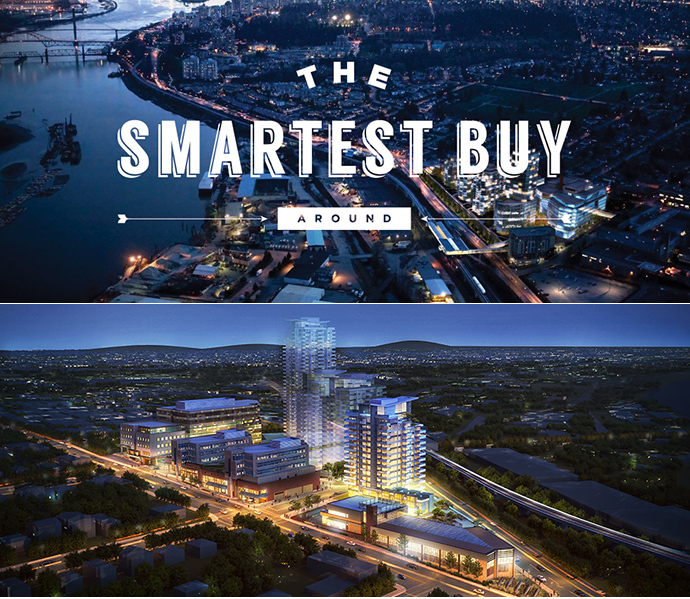 The Brewery District and The Sapperton Condos is brought to you by leading developer Wesgroup Properties. 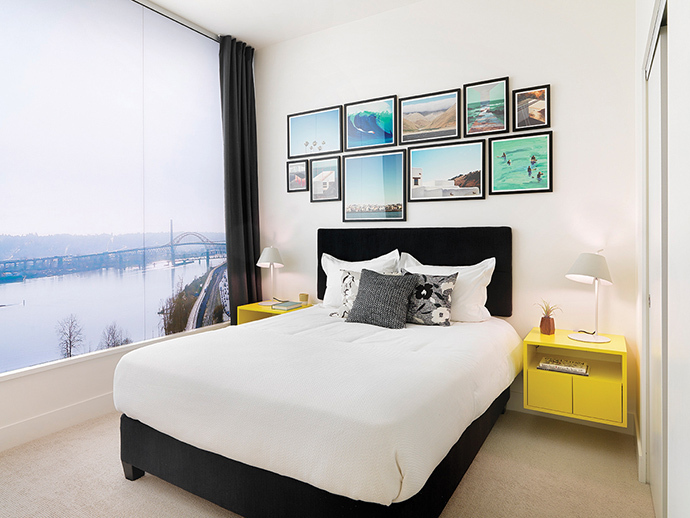 The beautiful homes at The Sapperton condos will feature two colour schemes for pre-sales homebuyers to choose from. There is laminate wood flooring in the main living spaces and broadloom loop pile nylon carpets in the bedrooms. The bathrooms will feature semi-frameless glass showers, custom thin edged floating shelf, dual flush toilets and porcelain tiled floors and ceramic tiled shower walls. The ensuite bathrooms at The Sapperton Condos in New Westminster will feature luxurious deep soaker tubs, under cabinetry LED lighting with motion sensors and wall mounted lighting in addition to a premium Kohler bathroom fixture package. The amazing kitchens at the New Westminster Sapperton condos in the Brewery District neighbourhood will feature a premium Whirlpool appliance package that includes a 19 cubic foot fridge with bottom mount freezer, 30” slide in gas range, Energy Star rated dish washer, AEG Perfekt glide 30” pull out range hood, full sized Energy Star 4.8 cubic foot front load washer and full size 7.4 cubic foot front loading dryer. Other kitchen features include a Kohler pull down kitchen sink faucet, modern uner mount single bowl stainless steel sink, stainless steel kitchen island on casters for optimal flexibility in select plans and recessed under cabinetry LED lighting. The Sapperton condos in New Westminster will also feature large format porcelain tiled backsplash, quartz counters and square edged cabinetry and drawers with soft close technology. 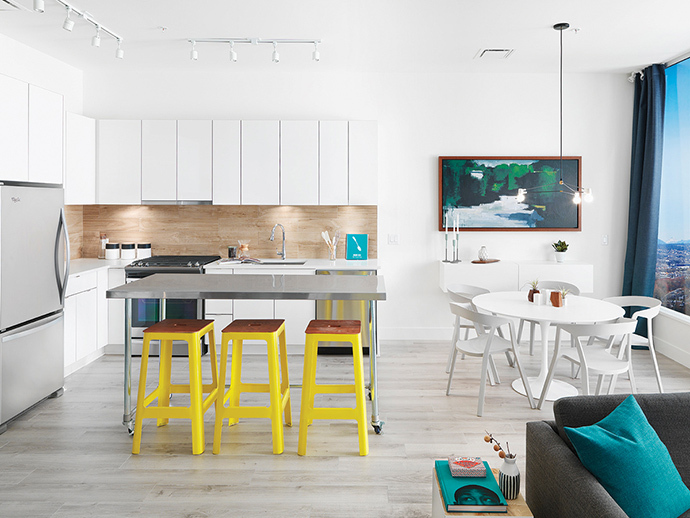 EFFORTLESS HOMES > Just like Brewery District, The Sapperton New Westminster condos are unpretentious, easy to love and filled with everything you need. Clean lines, convenient features and contemporary finishes come together to create a designer feel in a home that’s designed for living. The perfect New Westminster Sapperton floor plans with flexible spaces that fit your lifestyle are available right now. Host dinner parties, work from home and have extra room for guests right here! A forward thinking builder in Wesgroup Properties with over 50 years of community building experience is behind this amazing new development at The Brewery District in New West and they are commited to both sustainability and connectivity. Enjoy 360 degree views, take in incredible panoramic views of the Fraser River and North Shore mountains from your new home at The Sapperton! The Sapperton penthouses at Brewery District have high-end features that are exclusive to these amazing residences. Particularly in the kitchen, The Brewery District Sapperton penthouses will feature a stainless steel appliance package by KitchenAid that includes a 30” 20 cubic foot fridge with French doors and a 30” gas range. The homes will also have an AEG Perfekt glide 30” pull out range hood and an Energy Star rated dishwasher with hidden controls. The Sapperton penthouses in New West will also feature Whirlpool full sized Energy Star 4.8 cubic foot front loading washer and a full size 7.4 cubic inch front loading dryer. The Brewery District is a dynamic, Progressive District offering a mix of residential high-rises, shops and office buildings. Today, Wesgroup’s vision—to create a vibrant, complete community that supports the needs of a diverse neighbourhood —is coming to life. The first phase release is the residential tower number one called The Sapperton at Brewery District condos, which signifies the start of something very significant in the Lower Mainland. A Connect Community > The Brewery District Sapperton condos provide quick, efficient access to virtually everywhere in Metro Vancouver. A bright SkyTrain arrivals area, public plazas, greenways, view decks beautiful cycling paths, and a central community green create a vibrant gathering place. A Walk to Everything Community > This unique master-planned community featuring Tower 1 at The Sapperton Brewery District New West condos boasts businesses like Save-On-Foods, Shoppers Drug Mart, Browns Socialhouse and Starbucks. Brewery District Sapperton condos is also close to neighbourhood hotspots like Fratelli Bakery and Cap’s Bicycle Shop. Brewery District is a vibrant community that checks all the must-have boxes. With all your favourite shops within walking distance, and amazing indoor and outdoor amenities, Brewery District has everything you need. The Sapperton at Brewery District is the first high-rise condo development at the master planned New Westminster real estate development by Wesgroup Properties. Located at 285 Nelson’s Court New Westminster Sapperton Condos will feature one, two and three bedroom midrise condominium residences at affordable prices! The first of four concrete residential towers at the Brewer District master planned neighbourhood will be aptly named The Sapperton New Westminster condos as it is literally adjacent to the Sapperton SkyTrain Station. Some of the incredible new offerings in this reimagined neighbourhood includes a new Browns Social House restaurant, Starbucks, Shoppers Drug Mart and other big box retailers such as Save on Foods. Many of the homes at The Sapperton New West condos will have river views too! Presenting The Sapperton, the first residential tower in the Brewery District, the established Master-planned community built by Wesgroup. The Sapperton at Brewery District represents a forward-thinking builder, a safe neighbourhood, perfect floor plans and really amazing amenities. Be the first to the neighbourhood, be the first to buy. Sales Centre is located at 285 Nelson’s Court (200 block of East Columbia Street). Open daily 12-5pm (except Fridays).